That is a great example of peppering focused keywords in a natural and informative way at the very top of a website. The sentences, with their excellent search-engine-optimization copywriting attributes, along with a design that is pleasing to the eye, intrigued me. Let’s take a look and see if the rest of the website offers the same level of SEO health. The home page has plenty of good text. Graphics are nicely laid out yet secondary to the textual content; the graphics augment the content and not the other way around. This is ideal for search engines. Heading tags are also used and there is a sitemap linked to the home page and Alt tags are properly used. The home page has an ambiance that matches the products – the color scheme is calming and organic. 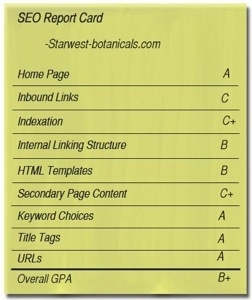 Starwest Botanicals has a home page PageRank of 4, which is quite respectable. Most category pages maintain a PageRank of 3 and many sub-subcategory pages (which are essentially product pages) have PageRanks of 2 or 3. Some sub-subcategory pages, however, drop to a PageRank 0. While there is no glaringly obvious reason for this, it is an issue that should be looked into. Yahoo! sees 2,583 inbound links to the website while Google sees 155. As always, directory submissions can be a helpful boost. Google measures 12,500 pages and Yahoo! sees 5,856. While Google has indexed more than twice as many pages as Yahoo!, there does not appear to be an issue with duplicate content. If the site owners know that their site contains close to 12,500 pages, they may want to re-verify the XML sitemaps to make sure Yahoo! is taking full advantage. Text-based navigation is used throughout Starwest Botanicals and landing pages with focused content exist for every category. This is always the best practice from an SEO point of view because it allows for a place to describe the category in textual content and also allows for another level of textual interlinking to the pages within the category. Secondary pages have decent textual content, though not quite as good as the home page. In some places, product pages are designed as sub-subcategory pages wherein several variances of a product are represented on one page. These generally have a good amount of descriptive content, but the individual product may suffer. Often, it only takes a sentence or two to properly represent keywords, and this could be done throughout the products. The site appears to have focused keywords throughout. I am not an expert in botanicals or tea, and the site may be highly keyword optimized, but there is always the possibility of improving keywords. Use of free keyword research tools could help to further focus. See my recent story on WordPot.com for an interesting keyword tool. Unique title tags appear throughout the website and have a general focus-to-page subject. They appear to be automated, which is fine. In fact, for automated title tags they are quite good and some appear to be manually tweaked, which is even better. URLs use keywords and are separated by dashes. They do not support any appendages and are ideal for search engine spiders to recognize keywords in them. While the website address – www.starwest-botanicals.com – is fine and also features a dash separating words, it might be advantageous to make www.starwestbotanicals.com, a URL owned by the company that properly has a 301 redirect to the primary domain name, as the main web address. There are enough references to botanicals on the home page that it is unlikely that search engines would miss the term, and it may be an easier domain name to verbally communicate. 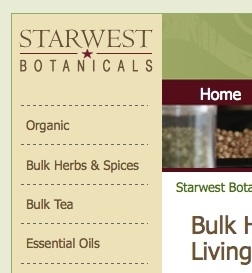 The Starwest Botanicals site is very nice both from an SEO perspective and a usability/design perspective. This is the type of site I would use as an example of what a good ecommerce site should be. Hats off to the designers and owners. With some added link building, this is a website that can easily obtain a PageRank of 5 or 6 that will be well distributed throughout the site. Request a SEO site grade by emailing seo.report@practicalecommerce.com.